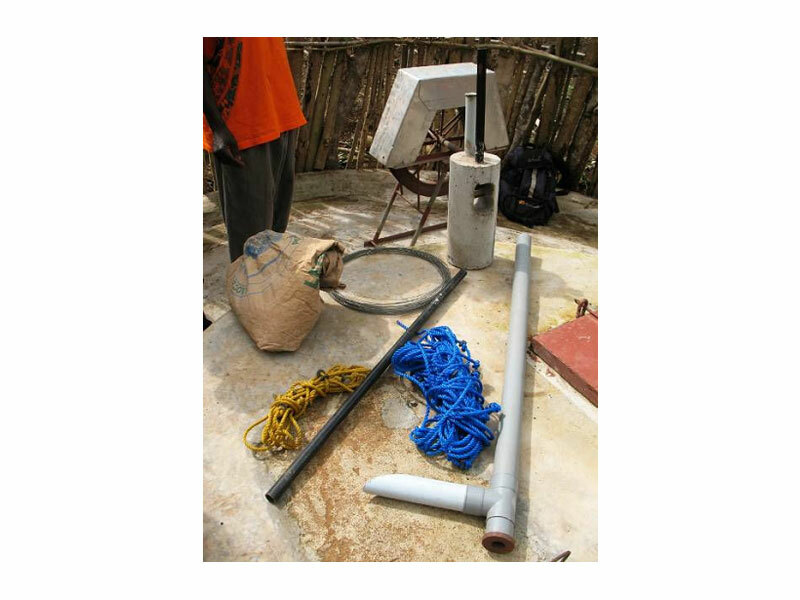 This is an effective water pump, one of the simplest to make and maintain, even locally. It costs little and can be used in a variety of ways, whether operated by hand or using various energy sources. It can be used to pump water up from 7 to 35 metres, or even 60 metres for some models. The principle of this pump is a very old one as the Romans used it as did various later civilisations. It had however been abandoned in favour of more modern techniques before being reused and improved in the mid-twentieth century. It seems to have reappeared in 1986 in Latin America (Nicaragua) before becoming highly popular on this continent, then in Africa and Asia. It is currently used in some thirty countries. - Easily maintained and repaired by the local population. Primarily families or small communities in rural or suburban areas or in small towns that have only very limited resources as well as small farmers for irrigation purposes. 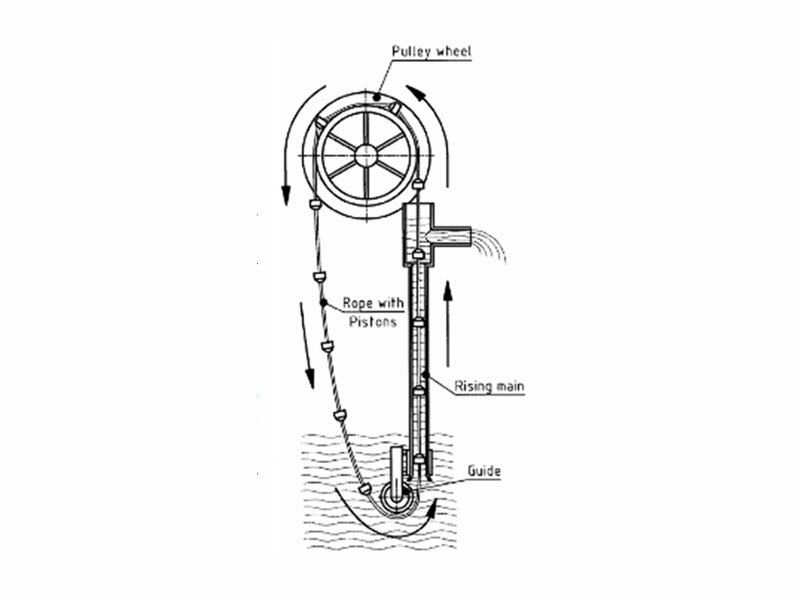 A rope pump is essentially made up of a wheel, a rope onto which pistons or rubber washers are attached at regular intervals, a PVC pipe and a guide block located at the bottom of the well. 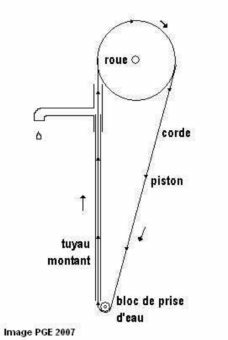 The rope, in one piece, is driven from the top of the structure and down to the bottom of the well by a wheel (grooved pulley) most often actuated by hand using a handle, but that can also be driven by a motor, a horse, a windmill, a bicycle, etc. 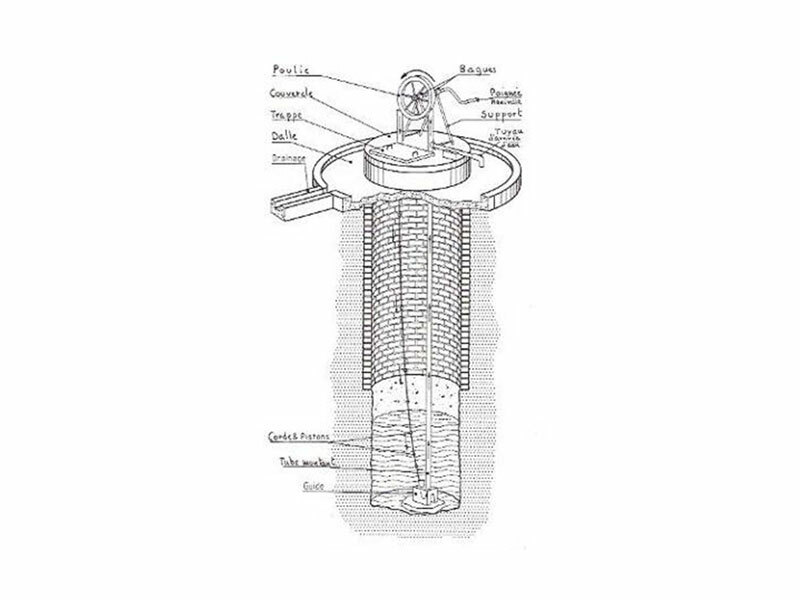 On the way into the well, the rope runs through a guide block so that it is precisely positioned to travel freely, along with the pistons attached to it, then it runs through a vertical PVC pipe. The rope rises back up to the surface through the rising main, drawing with it the water taken from the bottom of the well and retained by the pistons or washers when they enter the PVC pipe. Although the ideal rope material is polyethylene or nylon, almost any regular twisted or woven rope is suitable. Depending on the diameter of the rising main, the rope diameter generally varies between 4 to 8 mm. This is the main, but also the most fragile pump component. Its condition must therefore be checked periodically and replaced before it breaks, falls to the bottom of the well, making it very hard to run a new rope through. 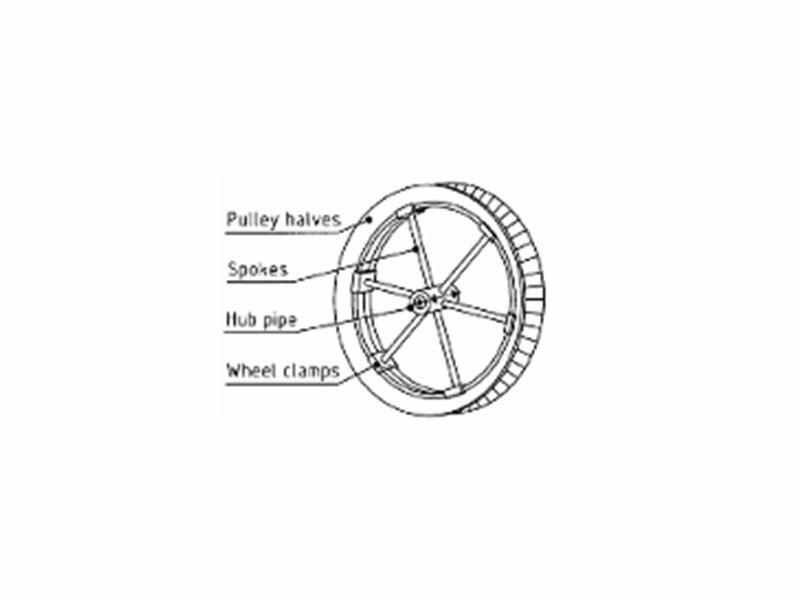 A grooved pulley is used that can be made very simply. It is possible, for example, to cut even a worn, but rigid car or van tyre in two. The two parts are then tightened together using four to six wheel clamps (e.g. made from folded flat wire) so that they form a V-shape that will create intense friction between the when and the rope, stopping the latter from slipping. Its purpose is to protect and guide the rope at the bottom of the well. Often made in a mould from cast concrete, so that its weight will stop it from rising, it can also be made from PVC or if the right care is taken. The rope guide block comprises a small vertical pipe that the rope enters into, that is flared on top, to facilitate piston entry, a glass bottle filled with concrete that the rope turns around, without becoming damaged, and a vertical connection to the PVC rising main. Shaped like a double triangle linked by cross pieces, this structure is essential to holding the wheel axle in the right position and to stop it from moving sideways. It is generally made from welded steel bars or pipes. It also allows adding wheel locking or braking mechanisms (as the wheel may suddenly move in the reverse direction under the weight of the water remaining in the rising main, when pumping stops) or a fixed pump cover. 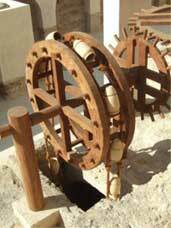 It can however be made even more easily using plain wooden planks or by building two small parallel brick and cement walls between which the wheel will be mounted. We recommend properly positioning the wheel axle, e.g. at 5 to 10 cm from the average height of the user’s elbows, to make it easier to use, especially by women and children. On some models, the wheel is placed outside of the structure and not in the middle. It is important to properly determine its diameter, as the latter is a function of well depth as the deeper the well, the greater the weight of the water column and the more tiring the pumping effort. RWSN (Rural Water and Sanitation Network) therefore recommends (see table below) reducing this diameter, for example, to 2 cm in excess of 20 metres. We recommend that they use a slightly greater diameter (see above) than that of the rising main so as to reduce the speed of the water so that will not come out of the upper pipe but from the outlet pipe. As PVC pipes exposed to the sun may deteriorate, we recommend varnishing them, preferably with a dark colour. The outlet pipe may be extended with a PVC pipe to directly supply a tank. These are made fairly easily in moulds with shapes and stamps, from leftover plastics or using wood or rubber. The pistons are generally attached to the rope with two ordinary knots (one before the opening and the other after it) every 70 cm to one metre (a little further apart for deep wells). Covering the rope extends its life by protecting it from the sun. 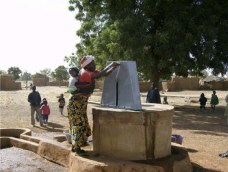 Covering the well protects it from intrusions, spilling or unclean water seepage. These protections may be one piece or fitted separately. 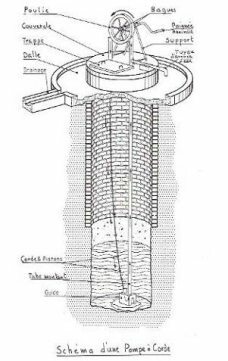 We recommend setting up the well and protecting it with a fence made from simple locally available materials and building a surface area or edged slab slightly sloped, around it, most often made from concrete, so as to drain away any dirty or stagnant water that could seep into the source and pollute it. Motor driven pumps are mainly used for large scale irrigation or for drawing water from great depths, depths that may reach 60 metres. Their flow rate is 20 litres/minute at 60 m, 60 l at 20 m and 120 l at 10 m. Note that it is also possible to pump water up from 60 metres, by hand, by installing two pumps. 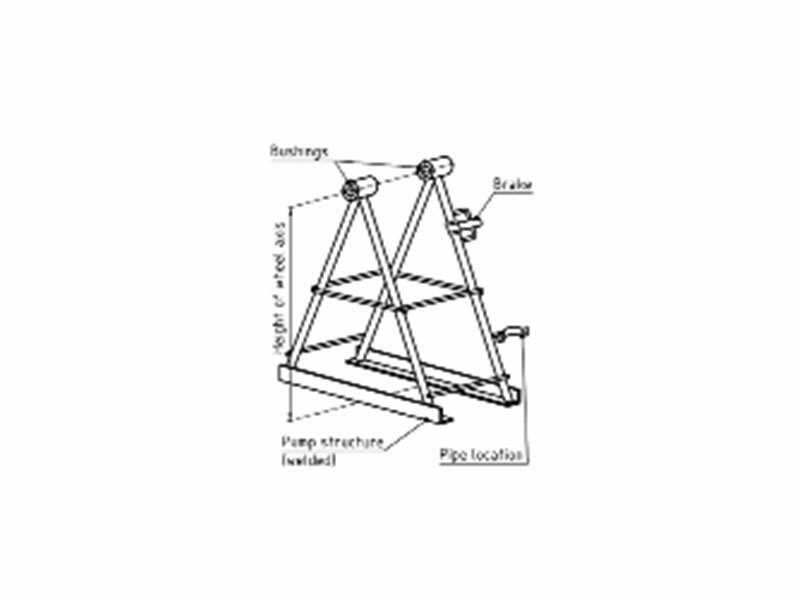 Rope pumps may also, but with greater difficulty, be used for drillings with a diameter of at least 10 cm, but this requires specific guides at the base of the drilling and on its upper structure. - The pump is easy to use and requires little strength from the user. It can easily be used by women and children. - It is ideal for two or three families living in a community but it can also serve a group of around a hundred people, and even, if some care is taken, double that number as its flow rate of around forth litres per minute can even be boosted to around a hundred litres if motor power is added. - These pumps are considerably cheaper than conventional mechanical piston pumps (3 to 5 times less). - They can be made and maintained locally using many locally available or recovered materials and the training required is quick and pretty easy. - Spare parts can easily be found from craftsmen. Some and even be made up locally. - These pumps can also work for irrigation even when there is mud and weeds in the water. - Making pumps locally stimulates local business creating jobs and income for small and medium sized businesses. - Covering the well and the pump protects the water from any outside contamination (waste, dust and anything else that may fall into the water). - Water does not come forth immediately after pumping starts, for the water falls back to the bottom of the well when the previous user stops pumping. So around one second per metre if depth is required before water comes forth (this can however be corrected by installing a specific system at the bottom of the well or by locking the wheel after use). - We also recommend installing a wheel braking or locking system, as the wheel spinning back may be dangerous for children. - A rope pump splashes more than other pumps. - It cannot normally serve more than some twenty families. - Easy to perform, regular rope wear inspections are essential. 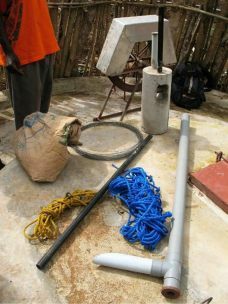 Do not wait for the rope to fall to the bottom of the well, as this could require dismantling the entire pump. Its tightness should be checked after the first few days in use. - Also check the wheel and handle for proper lubrication. - After installation, check that the guide pipe and the upper pipe are properly positioned by making sure that the rope is located right in the centre of the pipe. - A small opening in the well or drilling cover allows easy and routine or on demand disinfection, without having to dismantle anything. - Using the pump will be less tiring if the handle axis is located at approximately the average elbow height. - If the rope slips on the wheel during use, it must be retightened. - Each individual pump or set of pumps should be managed and maintained by a management committee when it serves an entire community. - Lastly, although the system is a simple one, having it installed by a craftsman or with his advice is recommended especially for the first installation as little mistakes (e.g. 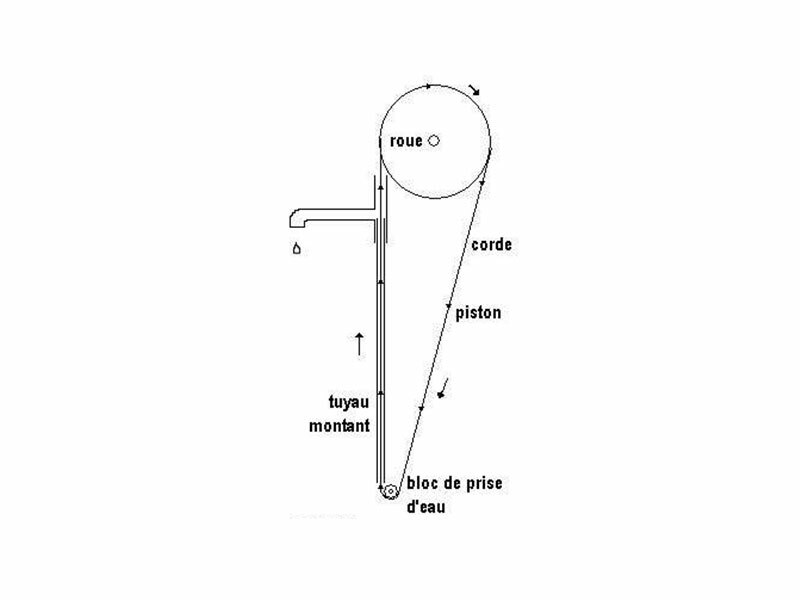 a piston diameter that is not properly adjusted in relation to that of the guide pipe, the wrong guide pipe diameter in relation to the well depth or an incorrectly centred wheel, etc.) can all compromise proper pump operation or can require it to be dismantled. If this is not possible, then we strongly recommend having detailed installation manuals available, like the ones mentioned at the end of this factsheet. - €25 to 70 depending on the model, the materials used, whether or not there is any labour cost and the country, for a manually operated pump producing some forty litres per minute at a depth of some ten metres. - €350 for a motor driven pump producing three time more water from the same depth. - €350 to 600 for a windmill driven irrigation pump that can produce some sixty litres a minute. - Some €250 for a horse powered irrigation pump that can produce twice that amount. Nevertheless, when wishing to setup a major hand pump installation programme or network with a production workshop and training courses, it is wise to plan on spending some €150 to 300 per pump, depending on quantity, model and country. In Nicaragua where these pumps were first installed and where there are more than 70,000 rope pumps, this installation has made it possible to reduce the need to import conventional piston pumps, leading to significant foreign exchange savings as well letting local production take over, while increasing the access to drinking water by rural populations by 25% in some ten years, an improvement rate three times greater than in other Latin American countries over the same period. This also made it possible to significantly reduce the pump failure rate, as the pump owners themselves were able to maintain and repair them. In all, 90% of these pumps are apparently still in operation. 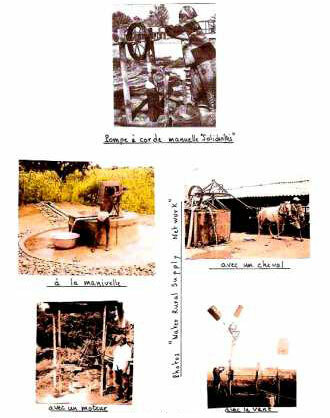 - URD (Urgences, Réhabilitation, Développement) : shorter and illustrated guide (5 pages) : "La pompe à corde" relating an experience in Tchad . - Installing rope irrigation pumps in Malawi that apparently allowed increasing the annual income of small farmers €190 : “Rope pumps Malawi : water, food and income” (two minutes). 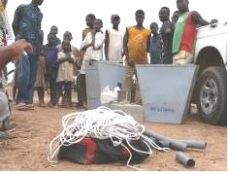 - “Rope Pumps, a technology accessible to all”, an interesting but long running video (26 minutes), shot by NGO Water Aid in Burkina Faso, explaining the principle behind this pump, how it is made locally or in a workshop at OCADES (Caritas Burkina) as well as how to set up and manage them through committees of villagers, bringing in experts from CREPA. - spanish video : "Bomba de soga" 3’ 36"" showing different fabrication and utilization methods in lain america. - “La pompe à corde. Guide technique de fabrication et d’installation” (Rope pumps. A technical manufacturing and installation guide). A clear, illustrated guide that is very handy and well documented, produced by the national commission for waterworks at Caritas Senegal in Dakar in collaboration with a number of other Caritas entities. - “Les pompes à corde. 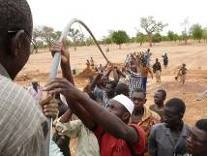 Visite d’échanges d’expérience entre le Sénégal et le Burkina Faso” (Rope pumps. Exchange of experience visits between Senegal and Burkina Faso). An illustrated 16 page document relating various installations and the problems encountered. Published Caritas Burkina and Caritas Senegal.